All is well on the Gaming Channel. Narun and I played Resident Evil: The Umbrella Chronicles, and quite a few more one-offs were recorded with my various associates. Tenoreo’s got Lily and me into jogging at least every other day, and it’s certainly helping my energy. Always good. So hey, Kakujo, how about that Kirby comic–AAUUGH!! Why is Pete’s hat green? WHY IS IT GREEN?! WHERE DID YOUR STRIPPED UNDER-SHIRT GO IN THE LAST PANELS?! NEXT TIME ON KAKUJOMICS Z! 1. I like Harvest Moon 64’s design! I-I mean *cough* what’re you talking about? Sleeves? I dunno, man. I assume you mean the box art design, since in-game it was the typical blue. Also, Chompers BEFORE Wall-Nuts? WHAT WERE YOU THINKING?! YOU’RE TEARING ME APART ZOMBIE BRYAN! >.< So…that Kirby comic huh? 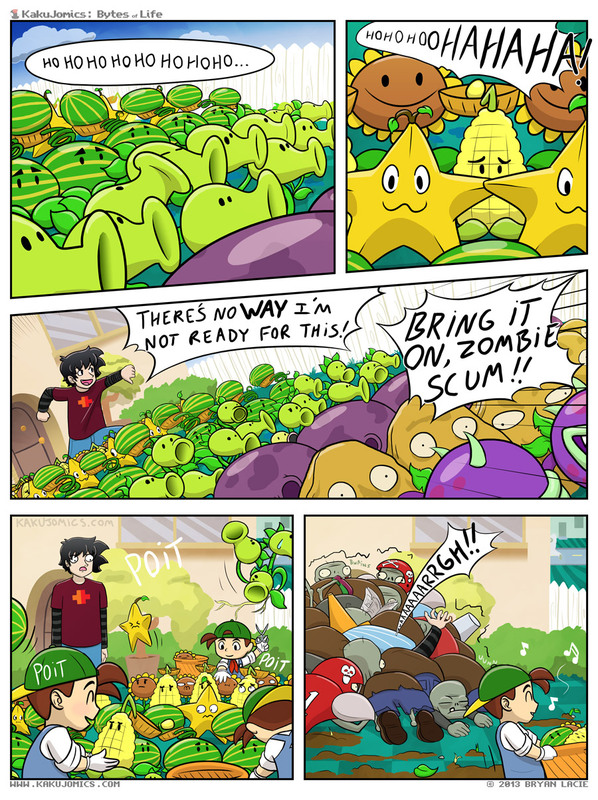 Anyway, I LOVE Plants vs Zombies. Except it's on le PS3…but whatever. Uhmmm…Imagine the farmer(any of them) of…. Harvest Moon…..in Don’t Starve since they have farming stuff…..And Wilson…in Harvest Moon….What do? Next week, Kakujo will upload a comic every day. HERE’S THE TWIST. Kirby will not be in any of them, yet we will all see him there. We’ve been deprived so long that we are imagining up hallucinations to fill the gaps. Eventually, Kakujo decides that the people don’t want Kirby any more with such positive responses. The hallucinations simply get worse and worse. Without knowing it, Kakujo has released a psychological weapon upon us all through the use of a webcomic. I have to say guys, I like your art, especially Ilia. I hope you will draw more of the kid.